According to Audrey Mae’s artistic cemetery map diagram and Audrey Mae’s gravestone numbering system, Sarah’s gravestone is Gravestone Number Twenty-Nine. Using her Smith-Corona typewriter in the 1980s, Audrey Mae typed the following mini-biography of Sarah, a seventh-generation Spencer in East Greenwich, Rhode Island. 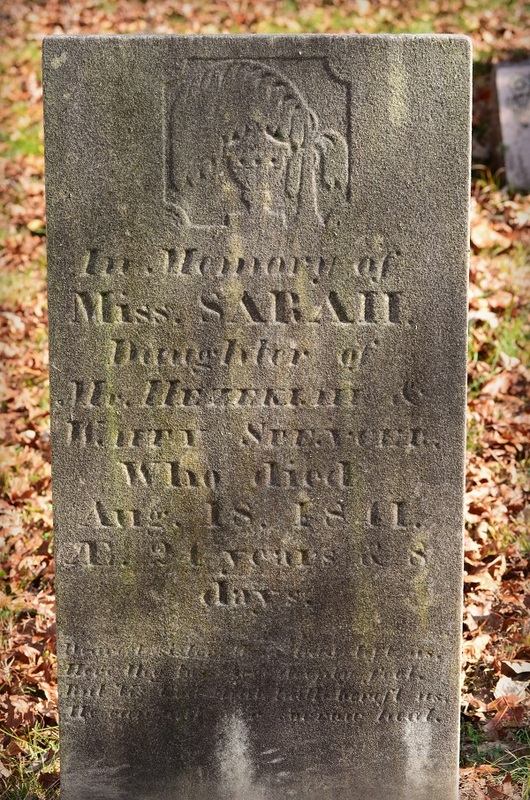 Sarah, the daughter of Hezekiah (gravestone No. 15) and Waite, died as a young woman. Sarah died in her twenty-fourth year, but Audrey Mae did not record the cause of her death. Gravestones 25-30 are the children of Hez and Waite (née Briggs) Spencer. According to Audrey Mae, Hezekiah (gravestone No. 15) and Waite (née Briggs) Spencer had twelve children. Six of their children’s gravestones are gravestone number 25, 26, 27,28,29 and 30. The six of their twelve children who are buried in this Spencer family cemetery all died young. Audrey Mae typed the mini-biography of Huldah, Lydia, Lucretia, Mary, Sarah and Huldah, the seventh generation Spencers in East Greenwich, Rhode Island. Hezekiah (Gravestone No. 15 in Audrey Mae’s gravestone numbering system), the children’s father, is the third son of Patriot John Spencer (Gravestone No. 2) and Huldah (née Johnson) Spencer (Gravestone No. 1 in Audrey Mae’s gravestone numbering system). 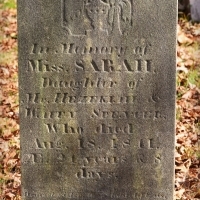 This entry was posted in All Gravestones, Born into the Spencer line, on December 21, 2012 by Heather.